Return to Providence Paranormal College in this full-length novel. Extrahumans of all types abound on this urban campus on the East Side of Providence, Rhode Island. This Ivy-League college recently opened its doors to anyone with enough talent. The Admissions Department at PPC enrolls humans with extraordinary grades, the magically and psychically inclined, vampires, werewolves, changelings, and even magic shifters like dragons and Kelpies. Come take a tour! If you like YA and NA Paranormal Romance or Urban Fantasy with strong romantic subplots, you’ll feel right at home here. Also be sure to check out Book 1, Barely Awake! D.R. Perry lives in Rhode Island, where all her books are set. Although she's not a native New Englander, once up north she got so inspired she couldn't leave. A wild Northern Muse attacked. D.R. used Typing; it was Super Effective. D.R. writes all kinds of things. Mostly, they have strange and unusual elements. Not strange isotopes or Strontium or anything like that, but creatures who are people or people who are creatures. Beware of the Attack Poetry and rampant puns. Keep off the grass, or the song parodies may bite. She lives with her husband, daughter, and dog in the Ocean State, which she loves to remind people is not an island and not Long Island. D.R. is well aware that her home state has both of those things, but isn't defined by them. Maybe she likes it here so much because it reminds her that she's also more than the sum of her parts. Proving the mask isn’t hiding a madman is probably hopeless, but preventing his past from destroying their love—may just be impossible. Four years ago Paris was under siege by Erik the murderously vengeful Phantom of the Opera, who swore no one would come between him and his student, the breathtaking Christine Daae. But a broken heart and a blast of conscience have changed him. Vowing never again to let his curse haunt the diva or the Opera Garnier, Erik is content for the world to believe he is dead. That is, until a good Samaritan begins leaving strange packages, awakening both his deepest desire and most forbidden fear—love. Anna has no way to escape the memories of her past or her bonded servitude to the owners of the Opera Garnier. Ministering to the less fortunate is the only bright light in an otherwise dark existence. When her kind gesture brings her to the attention of the masked and mysterious Erik, her need for redemption became a desire for true acceptances. But Erik’s powerful obsession with Christine and a deadly con that puts everything she knows at risk pushes her to face terrifying choices. Before lies and the legend of the “opera ghost” threaten the lives of any more people, Erik fights to control his demons and tame a heart torn between two women. Battling the nobleman determined to lock Erik away, Anna must help free Erik from his bonds of madness or once again seal his fate as The Phantom of the Opera…but saving him may just destroy her heart. If one is going to query a publisher, Jennifer suggests not doing so in pink ink. Her first, written when she was twelve, was nothing if not colorful. 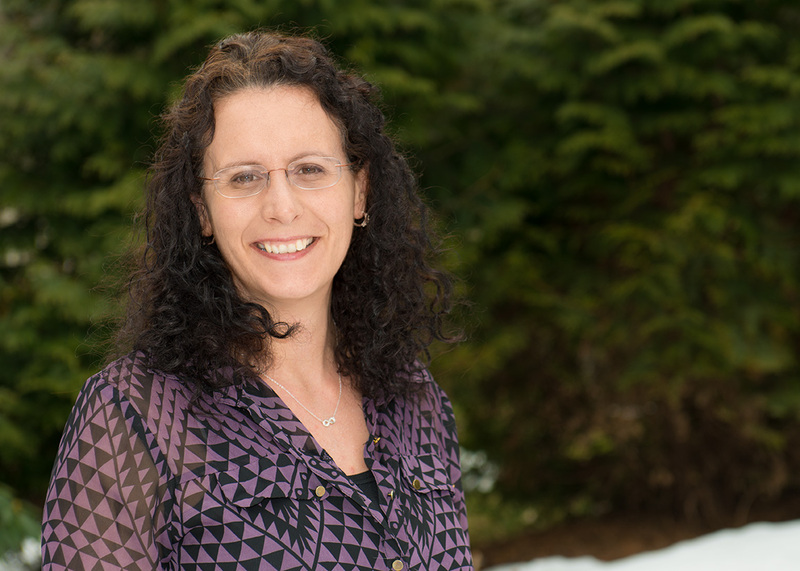 She is a member of the Romance Writers of America in addition to being a writing mentor. 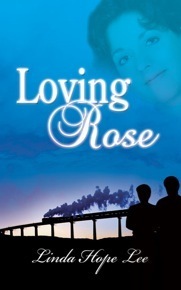 Her passion lies in writing historical romances from forgotten pieces of history. 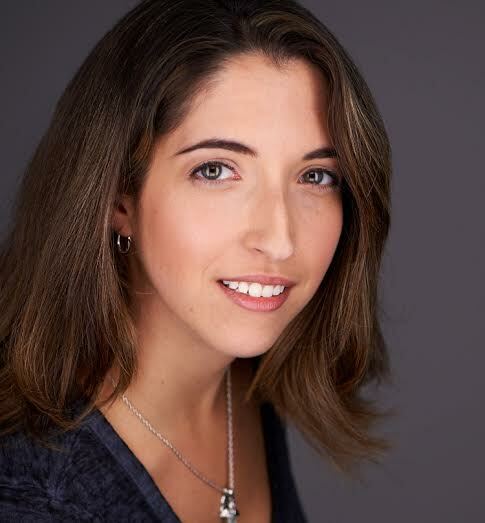 In addition to her series expanding Leroux’s The Phantom of the Opera, she writes romances set in the Regency and Victorian eras. Writing from a tiny French nook, Jennifer admits to being country mouse with city mouse tastes and is constantly fighting to keep the little critters in line. She firmly believes in OCD awareness and organizations that support mental health research, and her books often explore such challenges. She can’t pronounce pistachio, hates lollipops with gooey centers, and thinks watermelon is the spawn of the devil. Most of all, she dearly loves to laugh. When not writing she enjoys spending spends time in the kitchen with her daughter, digging through antique stores for a quirky find, and entertaining the whim of her mischievous pug. Turns out, the pug has her well trained. Devoted mother Cassie Carter is hard working and dedicated to running her small farm in Georgia. She tends to her home and sickly son daily while her truck driver husband is away on long hauls across the country. 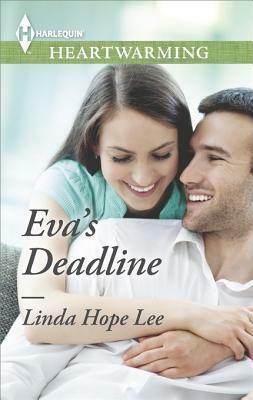 Her life and values take a sharp turn when a handsome and intelligent construction worker disrupts her daily routine. Her priorities shift and everything she keeps in her comfort zone is threatened. Damaged romantic Paul Hamilton has a void in his life that leaves him wandering from affair to affair, empty and unfulfilled. He identifies with the haunting poetry of Edgar Allan Poe, yearning to capture an elusive love. 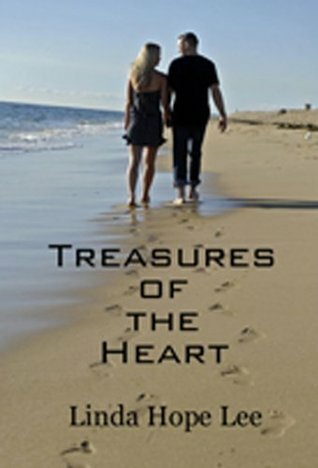 One day, in an unexpected place, he discovers the love he is seeking, but she is out of his reach and he runs the risk of irreparably damaging the delicate balance he tries to maintain in his life. 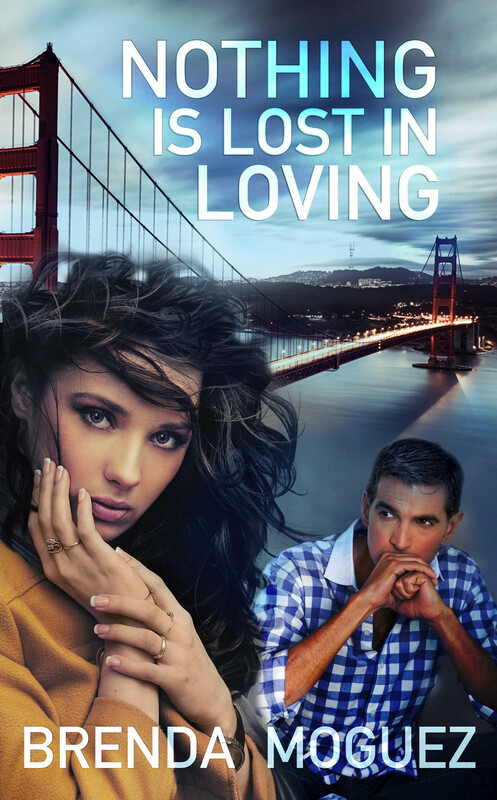 In the Duck Springs Affair, Paul and Cassie’s worlds collide and explode. 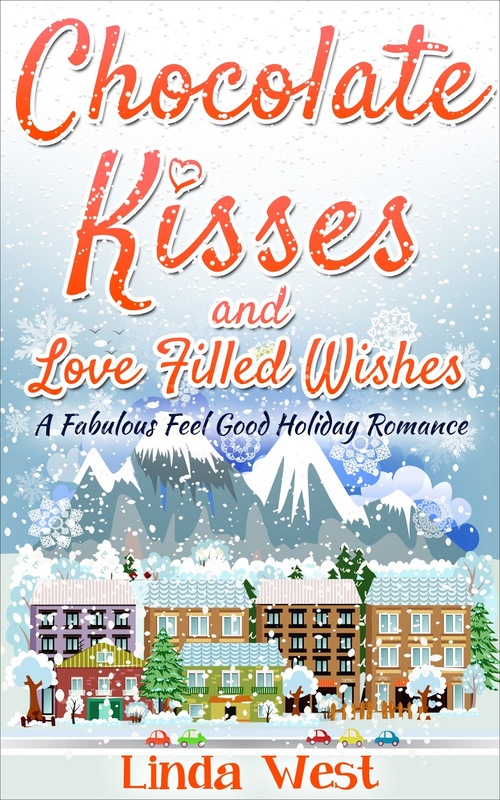 Will what they offer each other sustain and give them what they need out of life and love? Or, are they doomed to suffer the tragic consequences of their decisions as each searches for the perfect love? John Isaac Jones is a retired journalist currently living at Merritt Island, Florida. For more than thirty years, "John I.," as he prefers to be called, was a reporter for media outlets throughout the world. These included local newspapers in his native Alabama, The National Enquirer, News of the World in London, the Sydney Morning Herald, and NBC television. 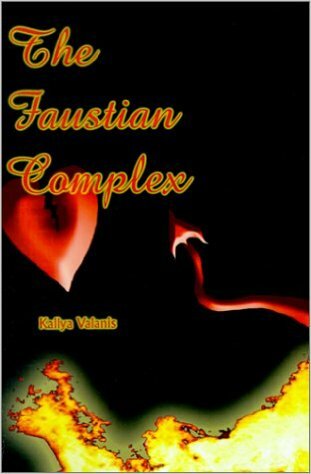 He is the author of four novels, a short story collection and two novellas. 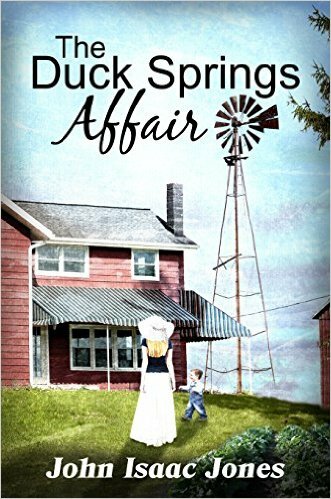 Summer and Brad are slated to get married but things go awry in Kissing Bridge! Brad's younger sister, snowboarding champion, Kacey Anderson is forced to come home to heal from a bad accident. After being told she can no longer compete she begins to train at her home while still missing her beloved Olympic gold medalist Brody Jenkins. Against doctor's orders she begins to regain her strength in the hopes of competing in the 2018 Olympics. 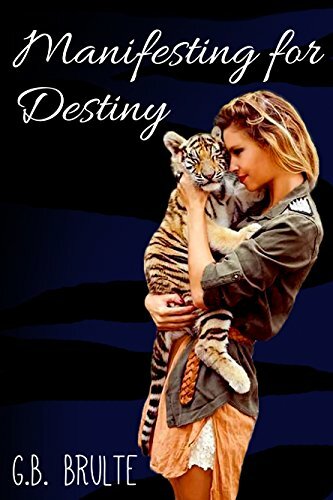 When a young Climate Change activist enlists her help to bring awareness to the cause, Kacey begins to think that her future may be much different then she imagined. Summer is forced back to LA to finish off a contract when the worst blizzard in decades hits her hometown. Unable to return she can only suffer as she here's a fate worse than she can ever imagine is unfolding back home in Kissing Bridge Mountain. Against all odds, love always seems to bring miracles to Kissing Bridge and this story will leave you believing and having faith in the power of true love. Katrina Ravel, a world-famous author, is deeply in love with Sergei Smyrnoff, a Russian sculptor. While reminiscing about the past, she recalls her parents' untimely death and the man who helped her survive her ordeal. The man is Marco Xenakis, a wealthy ship owner. 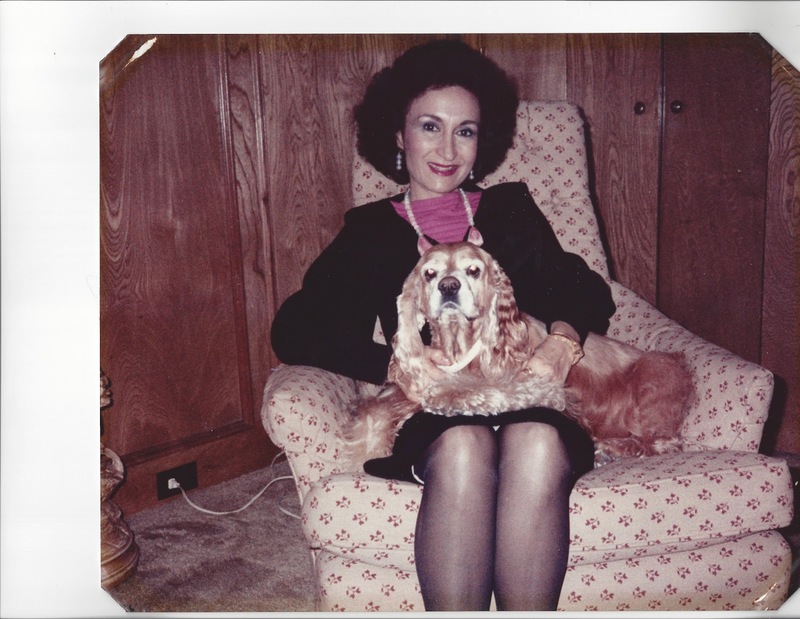 Both he and his housekeeper, Eleni, play a major role in Katrina's life. At Marco's house, she meets unexpectedly with George Venetis who, unbeknownst to Marcos and the others, is the Devil's Advocate. Venetis tries to lure Katrina to his camp, but she is apprehensive and resists his offer. However, her obsession for Sergei pushes her over the edge. 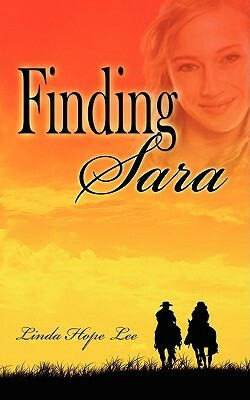 When, unexpectedly she discovers Sergei's infidelity, her apprehension vanishes. Grief stricken and in consolable, Katrina flies across the Atlantic and enters the Devil's lair. In the darkness of Hell, Venetis awaits patiently. Kallya Valanis was born on the beautiful island of Cyprus which, as legend has it, is the birthplace of Aphrodite, Olympian goddess of love, beauty and fertility. At thirteen her family moved to England where her father established his business. She continued her education in England and in her teens she wrote and published short stories for a teen magazine. She travelled to Sydney, Australia with her husband for a brief spell and then to the Territory of Papua and New Guinea where they spent four years. She has been living in the United States since 1968. Her first novel Hell In Paradise describes her experiences on the island of New Britain, New Guinea, about people she met and a murder she witnessed that left an indelible mark on her soul. 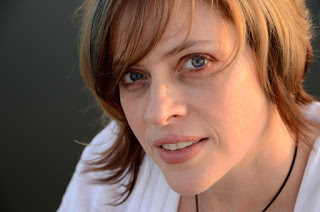 Today I am so excited to have my friend Melissa Lummis on the blog. 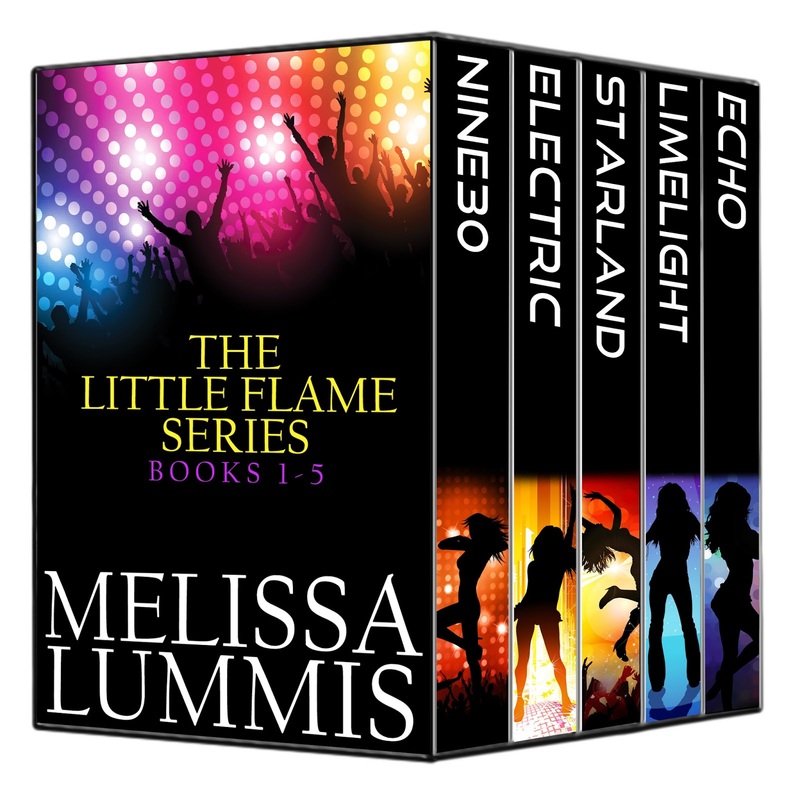 You may have heard about her Little Flames series. But you may not have known how it came to be. It's an interesting story. Hello! My name is Melissa Lummis and I write Paranormal Romance and Urban Fantasy. A big thank you to Andi for inviting me to write a guest blog today! 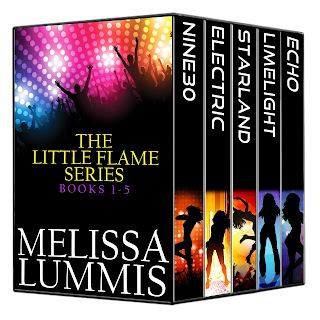 I’d like to share a little bit about how my current series, the Little Flame, got started. I’m often asked where my book ideas come from and the short answer is from my own experiences and a little bit of magic. When you write Urban Fantasy, that answer tends to raise eyebrows. Have I experienced the paranormal? Well, maybe. But there’s so much more to fantasy novel writing, and there’s all kinds of magic, isn’t there? For example, there’s how a story idea gels into an actual book, and it definitely felt like magic when the Little Flame series finally came together for me. I had an idea, about a healer looking for the reincarnation of a lover who could solve a magical problem, bouncing around in my head for months, but it felt vague. I needed a theme. I needed a setting. I was soooo frustrated. The reincarnated lover could be anywhere. Literally. So where did I want my story to take place? Where did I start? You can see the problem I faced. But as it turned out, the problem of setting became the magic ingredient that brought everything together, including the theme. As I often do when I have a writing problem, I headed out to have some fun. I went to Washington, D.C. for a concert with friends at the 9:30 Club. As we jumped on the Metro (D.C.’s subway) after the concert, it occurred to me that my main character could be on tour with a band! Yeah! I’d just seen one of the most spectacular EDM (Electronic Dance Music) DJ shows of all time so what if my main character was working at the 9:30 Club when she meets a DJ named Maximillian who hires her?! And ooooh! What if I called the first book Nine30??? And each title would reference a concert venue??? It all popped in my head! (I’ve been to a lot of concerts in a lot of cities). And this way she’d be traveling all over and have a better chance of finding this reincarnated lover, plus a steady paycheck. Bonus! And thus, a story was born. And that in itself is magical. Have you been to any of the concert venues I mentioned? Take a look at the other titles in the series and see if you can guess the venue they reference. Enchanted: The Fairy Revels Collection plus Giveaway! Trix Woodcutter and I invite you all to join us on this newest adventure. Trix and the Faerie Queen is filled with more talking animals than I ever thought I would write and a journey to a place from my dreams: Under the Hill, to the high seat of the Faerie Queen. There are so many characters in this story (Alastair is going to hurt me when he starts making notes for the audio)--I won’t tell you which one is my favorite. That is a choice you must make yourself. “Trixie, you are a prize idiot,” he said to himself, because neither Peter nor Saturday were there to say it for him. He took a deep breath and dove hard. “Perhaps our next attempt at swimming should be in a shallower pond,” she said when she caught her breath. "Trix and the Faerie Queen, by Alethea Kontis, is just as awesome as the previous book, Trixter. I love these two of all the Books of Arriland most of all because they are so full of light and laughter, as opposed to the creepy dark magic in a few of the others. I also love how all the books tie together so perfectly." Trix held fast to Lizinia’s hand, but he did not move. The noise had happened, but he felt no vibrations beneath his feet. Not so much as a breath of wind stirred the leaves in the trees of the forest around them. He closed his eyes and searched inside himself for the Fear that Needa the spider had taught him about. There was a sort of…tingle…at the back of his neck and in his belly. This might have been the animal magic inside him telling him flee, but his instincts were still not strong enough to know where. "Readers will enjoy the blossoming fairy tale friendship between Trix and his golden girl Lizinia. Their budding relationship is totally fairy tale--Lizinia is the perfect companion and Trix is completely appreciative of her talents. Fans of Arilland will be happy to see a couple of Trix's sisters and hear about more. Readers will be left clamoring for more at the end of the novel and eagerly await the next installment." Power. The woman’s voice that filled his ears was powerful. It reminded him of someone—a member of his family?—but he could not place it. The moment Trix put all the pieces together, he was too shocked to reply. What in the world did the Faerie Queen want with him? If this even was the world…on this grassy mound, surrounded by a ring of mushrooms. Even the mushrooms bowed, bonnets to the queen. 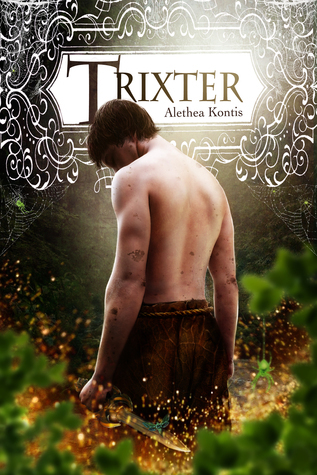 "I'm really glad there's more than one book about Trix and his journey because the first book, TRIXTER, is novella-length and we don't spend nearly enough time with Trix or his new, gold-dipped friend Lizinia. . . . 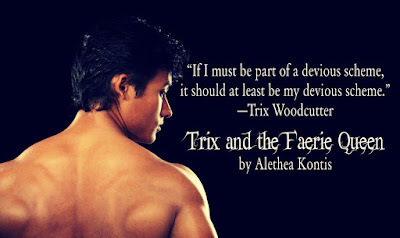 I love the way Trix is also at the center of an epic prophecy, as are many of the Woodcutters." 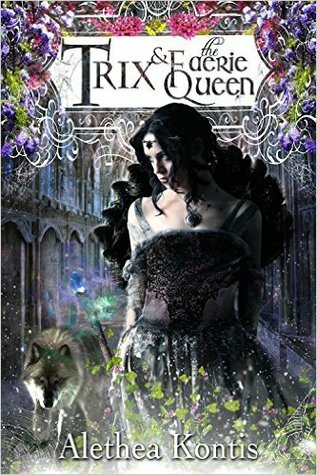 Though not a long story, Trix & the Faerie Queen packs a powerful punch. It doesn't slow its pace for a moment as our lovable scamp Trix and his golden companion Lizinia fall into one scrape after another. We get the chance to reunite with some familiar faces, and to put faces with a few of the names we've heard about. And we finally get to go to Faerie. *squee!* . 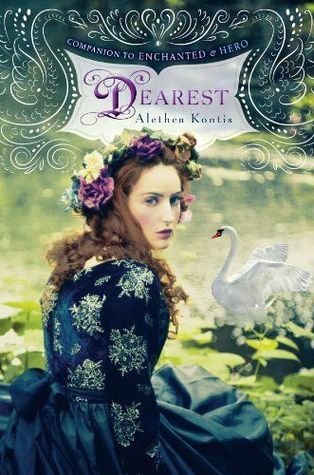 . . With the ending I am left with here, waiting even until fall for Alethea's next book seems far too long a wait. “TEHETHJO” is one heck of an acronym, but Alethea Kontis knows what it means, why it’s important, and how it relates to her new novel Trix and the Faerie Queen. Join Trix Woodcutter on an epic new animal-filled adventure! Fey magic and animal magic: that troublemaking imp Trix Woodcutter has both, if not the ability to use them to their full potential. While traveling with his companion—the golden girl Lizinia—to see the King of Eagles, Trix is sent a vision of the Faerie Queen, who is in desperate need of his help. An evil sorceress has stormed Faerie and trapped all the fey magic under the Hill, leaving the Faerie Queen powerless! Trix’s talent for communicating with animals is desperately needed…but before he braves the wild world of Faerie he must arm himself, with nothing less than the bow and arrows of a god. With the help of his gilded companion, her ghost-cat godfather, a blind brownie and a sister or two, the Boy Who Talks to Animals must befriend a mischievous leprechaun, best a wolf, and journey into the depths of Faerie to restore order and free the fey magic before the imbalance destroys the world. 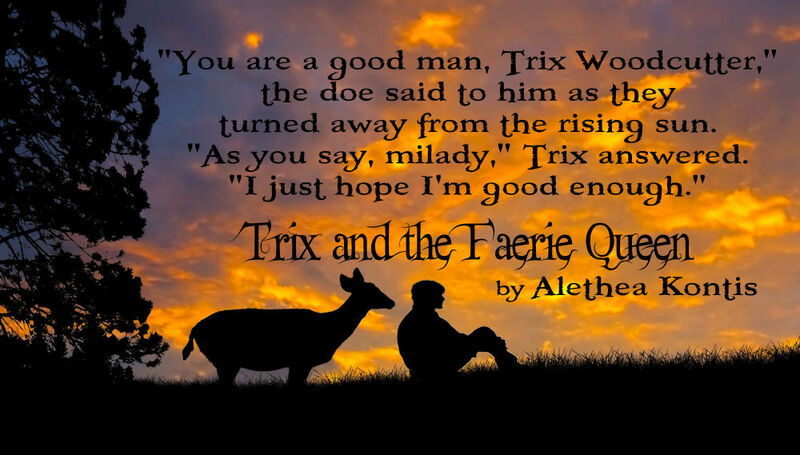 Trix and the Faerie Queen is second in The Trix Adventures and sixth in the Books of Arilland. Fans of the Woodcutter Sisters: Desperate to know what happened to Saturday and Peregrine after they found Trix at the end of HERO? Here’s your chance! 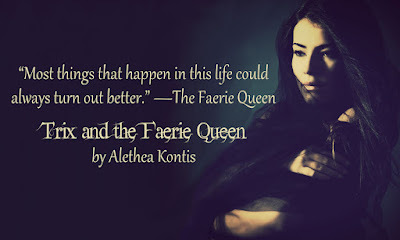 Alethea Kontis is a princess, author, fairy godmother, and geek. 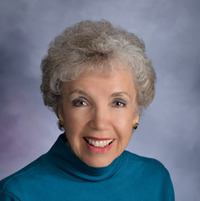 Her bestselling Books of Arilland fairytale series won two Gelett Burgess Children’s Book Awards (Enchanted and Tales of Arilland), and was twice nominated for the Andre Norton Award. 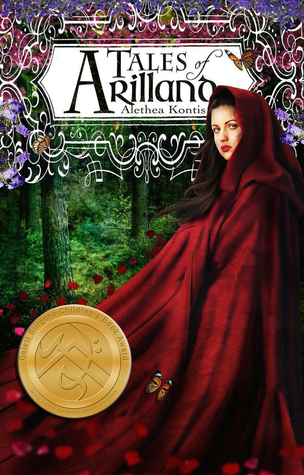 Alethea also penned the AlphaOops picture books, The Wonderland Alphabet, Diary of a Mad Scientist Garden Gnome, Beauty & Dynamite, The Dark-Hunter Companion (w/Sherrilyn Kenyon), and a myriad of poems, essays, and short stories. Princess Alethea lives and writes on the Space Coast of Florida with her teddy bear, Charlie. 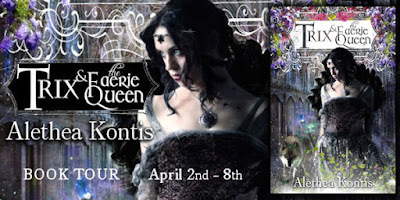 You can find her on her YouTube channel, all the social media, and at www.aletheakontis.com. When writing a new story, I often begin with a setting. Such was the case with Dark Memories. I live in the Pacific Northwest, and one year I took a trip to our country’s opposite corner, where I visited Vermont. I had never been there before but had heard how beautiful the countryside is, and it did not disappoint. "This hooked me right from the start. . . . 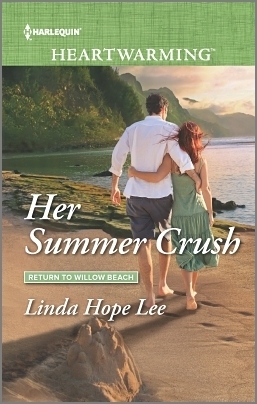 I liked Deborah and Milo and how they have to work together to solve the mystery and learn to forgive along the way. I thought the mystery was well done, I like trying to figure out who the bad guy is and being surprised in the end." Deborah did not want to share Carla Cassidy’s fate. The young woman’s tragic death was the reason Deborah left Fairfield four years ago. Now she was back, intending to once again make the small town her home. The cruel note told her someone didn’t want her to return. His deep voice rang with friendliness, and if Deborah’s instincts were on target, his gaze held more than a hint of male interest. Despite her annoyance with the car breakdown, she experienced a tingle of excitement. Understanding glimmered in his dark eyes. “Okay, I get it. You’re afraid to go off with a stranger, right? Don’t blame you. Can’t be too careful these days. But, let me introduce myself, and then we won’t be strangers anymore. "The author definitely tries to give you a sense that everyone is guilty so you don't know who it really is but suspect everyone. There are a lot of people to suspect with possible motives. . . . This book was clean and I really appreciate that." As Deborah listened to Milo talk about his farm and horses, she leaned back and relaxed against the cool leather. She even allowed herself to daydream a little. He seemed such a congenial person, not to say handsome and appealing. Perhaps they could forge a friendship. She doubted there was a Mrs. Jordan. If a wife existed, surely he would have mentioned her by now. Manifesting for Destiny by G.B. Brulte FREE today only!